Snow in Sequim is not common, and this much snow is something that only happens about once every two decades. Sequim weather is famous for being mild without extremes, either hot or cold. Summers are typically in the 60s and 70s, and winters are typically in the 40s and 50s, but not this February. Of course, the entire country is getting crazy weather this year, too. Snow in Sequim: Are You Serious? Snow in Sequim is so rare, at least snow that sticks for a few days. When we do get snow like this, children are out sledding and laughing with the kind of deep joy that only comes from children going sledding for the first time. It’s a joy to experience, and I experienced it with my own children when they were young 22 years ago. The video above is my home and my dog . . . out playing. When we do have snow in Sequim like this, we stay home. Unless you have to work, you wouldn’t risk an accident or getting stuck somewhere. It’s a heavy sticky snow, because the temperature goes above freezing during the middle part of the day, and that makes it hard to drive through, unless you have a high four-wheel drive. This kind of snow and cold weather won’t last long, so even if it lasts a week, as they say, “this too shall pass.” Snow in Sequim is fun, but also a little dangerous if a person is not prepared. We stock up on food and wood for heat in case we lose our electricity. That’s rare, too. For now, we will enjoy snow in Sequim while it lasts. Snow in Sequim–Are You Serious? Today I answer the question, “Does Sequim get snow?” with this photo. Now you know the dirty little secret. The answer is yes to “Does Sequim get snow?” This is February 8, 2019, and the Heavens are pouring snow upon the land with huge snowflakes. Make that gigantic snowflakes. 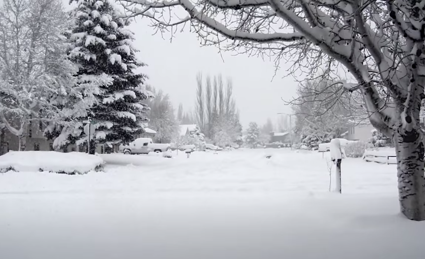 It was about 18 years ago that Sequim was hit with a record snow fall. I remember it well. We were all snowed in and couldn’t even get out of our driveways for several days. I dug my driveway out with a shovel and got to Safeway on the 3rd day of the snow, but the shelves were empty, at least for all the basic items we like to buy. All the bread shelves were empty, the milk was gone, no eggs left, not a banana in the store. It was a fascinating experience for me. Does Sequim Get Snow? Are You Serious? Go Shopping! So yesterday in preparation for the coming snow, I went to Safeway and Costco to pick up a few things. I got the very last shopping cart at Safeway, and many of the shelves were almost empty. I have never seen Costco this busy since they opened up in Sequim over a decade ago. The parking lot was almost full, and it normally is only half full. Does Sequim Get Snow? Yes, but it’s been 22 years since I’ve seen snow like this. It’s kind of fun for a change, and young children always enjoy seeing snow and sledding for a day or two. My dog loves playing in the snow. But it is dangerous for many, because there will be some car accidents, and some people will have trouble getting out to pick up food or prescriptions. So while we can say yes to does Sequim get snow, we can also say that it’s rare, unlike New York (and elsewhere in the midwest and northeast) where they see this kind of weather (and worse) every winter. If I get anymore phone calls today, maybe I’ll just have some fun, and go back to my original welcome about returning the call from sunny Sequim. On the other hand, if my caller asks, “Does Sequim get snow?,” I will be honest and share this photo with them. California fires are once again driving people out of California to the Northwest. The total loss of one’s home and everything in it would be a nightmare of epic proportions for sure, but there’s much more that is driving people out. My California buyers are using almost the identical descriptions with phrases like these: forest fires, increasing crime, illegal aliens, political insanity, increasing traffic nightmares, increasing regulations and bureaucracies for business owners, increasing taxes, draughts, floods, and the looming threat of a big earthquake. What is happening in California is disturbing, and now the state is losing the middle class in a mass exodus. Why are many of these Californians moving to Sequim? Of the long list of nightmare phrases that explain why they are leaving their beloved California, Sequim has virtually none of these, with the exception of the potential big earthquake. California fires are just one of the major problems. In the case of a big earthquake, there is a dramatic difference between living in California and Sequim. If the big one hits California, the freeway on-ramps and exits will likely be down, electricity will be off, gas stations will be closed, grocery stores will be out of food within hours, municipal water systems will be down, cell phone service will almost certainly be down, and there will be mass destruction of buildings. You won’t be able to escape, because there will be no way of escape! And then, you know what would be coming next. As you huddled in your home or emergency shelter, the criminals would be out in force at night stealing food and anything else they wanted. Do you really want to be forced into a Wallmart FEMA shelter for who knows how long? The military will be guarding these FEMA centers, and there will be security fences and security gates so you cannot leave. Why? They will keep civilians in the shelters “for their own protection.” There’s no way they will let you come and go at your leisure. Contrast that with living in Sequim in a big earthquake. In my single level 1850 square foot home I would have some broken windows and some broken dishes, but that would be the extent of the damages. I have a private well and private septic, and I have a backup generator that runs on propane or gasoline. I have some emergency food on the shelves for a period of months. Of course, the area power would be down, there would be no cell phone service, the gas stations would be closed, and the grocery store shelves would empty of staple items within hours. While those consequences create a nightmare scenario in metro California, it would not here in rural Washington. Since Sequim is too far from Seattle/Tacoma and Olympia with the bridges down and no direct access (other than boat) for outsiders, Sequim would not suffer the onslaught of roaming criminals and masses of starving people. They would in Seattle, but not in Sequim. I would also point out that we have plenty of crystal clear water flowing out of the Olympic Mountains, and we have fishing galore, and we have masses of deer and wildlife. We also live in an agricultural area with a lot of organic crops and an untold number of beef cattle in the area. The point is, we have a lot of ways to survive here that Californians simply do not have. Many locals have their own organic vegetable gardens and many also have some animals, like cows and sheep. I’m not interested in going conspiracy theory on you, and I won’t because I’m not a conspiracy guy, but if you’ve read some of my 2,000 blog articles or any of my dozen books, you’ll recall this statement, “The answers you get are only as good as the questions you ask.” Too many people are not asking the right questions, so they never do get answers to some critically important issues. I was a forest fire fighter for the Bureau of Land Management in Alaska for four summers as I worked my way through college. I know how forest fires travel, what their limits are, and how they catch houses on fire. It is virtually impossible for a forest fire at 1,100 degrees to melt glass and steel like we are seeing in these California fires. It also does not make sense that houses are reduced to ashes with all the appliances and metal melted to nothing while there are still green trees standing around the houses. I speak from truth, since there are many Youtube aerial videos showing this exact reality. I don’t know the answers to the question, “What is going on with these California fires?,” but I can tell you as 30-year fire fighters in California have said, “Something is terribly wrong here.” I’m not answering the question. I don’t have that kind of knowledge and wisdom, but there are legitimate questions out there, and this video raises some of them. Please don’t jump to conclusions and assume that I am a conspiracy theorist. I’m not. I’m only raising questions, not answering the questions. Why are people leaving California? The California fires are one reason, but just one of many. Yesterday a Redding man who is in Sequim looking at homes told us that his home just burned up in Redding. How tragic! I wish he had sold his home long before the fire and had moved to Sequim before he lost his home. All of these reasons and the unanswered questions about the fires are legitimate reasons there is such an exodus from California to Sequim. Sequim summer has broken out all over the place. In this short Sequim video, I’m sitting in one of my favorite places in a chair in my back yard looking at my gorgeous panoramic view of the Olympic Mountain range from Sequim all the way over to Hurricane Ridge above Port Angeles. Listen for the birds singing in this video. This is a great time to come and visit Sequim if you are still trying to decide where to retire. Schedule your tour to see homes with ChuckMarunde@gmail.com. P.S. If you don’t already know it, we should tell you that Chuck Marunde is the most experienced buyer’s agent on the entire Olympic Peninsula. Not only do you get decades of real estate sales experience, you get the experience of a 20-year real estate attorney. Do your due diligence, but don’t you want to be represented by the most qualified broker who will protect your interests and negotiate the best price and terms? 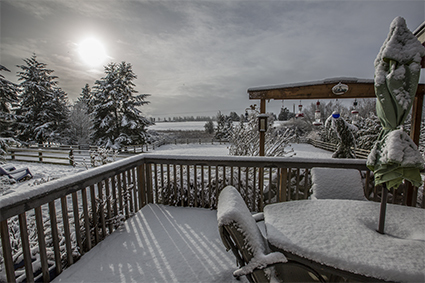 Snow in Sequim is rare, but this just happened overnight! Amazing and beautiful! This is our first snow in Sequim in about four years. My dog didn’t know what it was, but he figured out he likes to lick it. Since I took this photo this morning, the sun has risen higher and the clouds have cleared, so it is now approaching 40 degrees at 10:45 in the morning. The snow may be gone by the end of the day. When there is snow in Sequim, all the kids run outside to play in it before it melts. There’s not really enough snow to sled, but some of us have sleds our kids can ride in the back yard or in the park. There are a few small hills where kids will sled for a little while before the snow melts. Robin Hill Park has a nice little sledding hill where my own children had fun. Fortunately, when there is snow in Sequim, the highway department quickly clears the snow from the roads, although most of it just melts as soon as the sun comes out. Soft snow isn’t dangerous to drive on, because there’s decent traction on soft snow. It’s only when the snow melts and freezes or when it gets packed and icy that it gets dangerous. Your average retiree in Sequim is smart enough to just stay home until it melts on the roads. Life is safer that way when there is snow in Sequim. This morning we had our first frost in Sequim. It’s a beautiful sunny day with hardly any clouds in the sky. It was very early this morning when I heard my Sequim weather station tell me the temperature outside had reached 32 degrees. That didn’t last long. The temperature went up to 40 degrees shortly after the sun began to melt the frost on the blades of grass in my yard. We’re in December, and it’s finally getting cold. Of course, cold for Sequim in the winter is a quick dip to freezing in the early morning hours, and so today was the first frost in Sequim. I love it. The yards and fields are all bright green as you can see in this photo above. 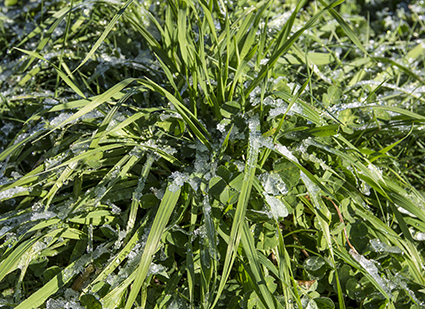 The grass hardly grows during the coldest months of December and January, but since this is the wet time of year, the grass turns a bright green and stays that way all the way into the summer. It’s hard to predict the precise date that will give us the first frost in Sequim. People ask me, “What are winters like in Sequim?” I usually say something like, “Which winter?,” because it seems every winter is a little different. We haven’t had snow in Sequim for three or four years. When we do get snow, it’s usually a couple of inches and melts within hours, but since we rarely see it, it is fun for a short time. With a little luck, maybe we’ll have a white Christmas. Because our winters are mostly in the 50s, and our summers are mostly in the 60s, we have an incredibly mild climate without those darn cold extremes of the midwest or the east coast, and we don’t suffer the hot extremes of the south. I sold homes to couples from Virginia and Pennsylvania recently, and they both reminded me of how humid the heat can be on the east coast. Our first frost in Sequim reminded me of how mild our Sequim weather really is. What a beautiful day for a walk with my dog. 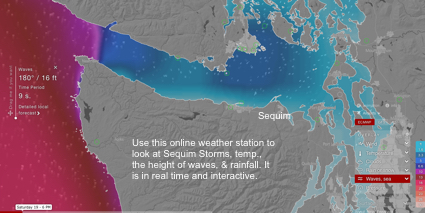 Sequim storms are rare, but we have some incredible online tools now to see the exact weather in real time, including the wind and the height of waves at any point you place your mouse on the map. We are in the winter months now, so Sequim storms are more likely for the next couple of months. You’ll love this new site which is the most powerful one I’ve found at Sequim Storms. About a month ago we received a weather warning regarding Sequim storms, and the report stated that the storm could be worse than any storm since 1962. I made sure I had extra water supplies at home as well as food to last in case we had a terrible storm. I used the map above to look at the wind and waves on the Pacific side of the Olympic Peninsula, and also to see what was coming down over Sequim from the Olympic Mountains. I could even measure the height of waves on th Strait just north of the Sequim shoreline. Guess what? The great storm missed Sequim, although it hit all around us, including the Oregon and Washington Pacific shorelines, and even Tacoma and into Canada across the Strait. As I’ve said before, bad Sequim storms are really quite rare. You can use this weather site above [Sequim Storms] to look at weather patterns, waves, temperatures, and wind anywhere in the world. Don’t you love the technologies available to us on the Internet? Sequim Weather is . . .
Sequim weather is cloudy and overcast, wait . . . Sequim weather is sunny and beautiful. Well, it all depends on the time of day lately. 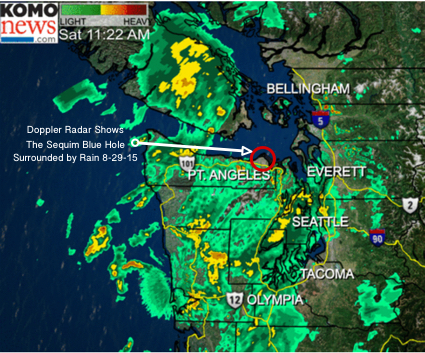 Sequim weather is famous for its blue hole or as it is also known, the Sequim Rain Shadow. Retirees from all over the United States find Sequim when they are researching the best place to retire, and part of that decision includes the best weather, an even climate without extreme temperatures and without natural disasters. Voted one of the 10 Best Places to Retire in the U.S., Sequim keeps showing up for all those who diligently search. I understand extreme temperatures, because I have lived in the two greatest extremes in the U.S. In Alaska I learned what 70 degrees below zero was like almost every winter, and in the summers in Nevada I learned what it felt like to work in 100 degrees in a military uniform. Sequim winters are in the 40s and 50s, and the summers are in the 60s and 70s. How sweet it is. Whatever you are looking for in your retirement years, it’s hard to beat such an even climate and only 16 inches of rain a year, one-third the rainfall of Seattle. Sequim weather is delightful, although it’s not always sunny. Don’t tell anyone. This Sequim Flood caught my eye, because it covers several lots that have been for sale for years, and I had no idea that these lots could be under water until now. This is on the north side of Sequim about six miles from downtown Sequim. You can see an aerial view of this mini Sequim flood on the video below. Here’s an interesting video angle from about 60 feet above the water. This perspective is taken from Hogback Road just off Lotzgesell. This little Sequim flood is not near the Sequim-Dungeness River, and it’s not at the base of a mountain range where it could collect water, so how did all this water rise to record levels in this neighborhood so close to the bluff? This is a low area where the water table is naturally high and where surface water can gather after a lot of rain, and this has been a record winter for rain in the Sequim area. This kind of Sequim Flood is not a Common Occurrence, and that’s what made this event worthy of a video. It does make an interesting point, however, for anyone thinking about buying a vacant lot to build a home. These lots under water are part of a short plat that was surveyed, and utilities were installed. 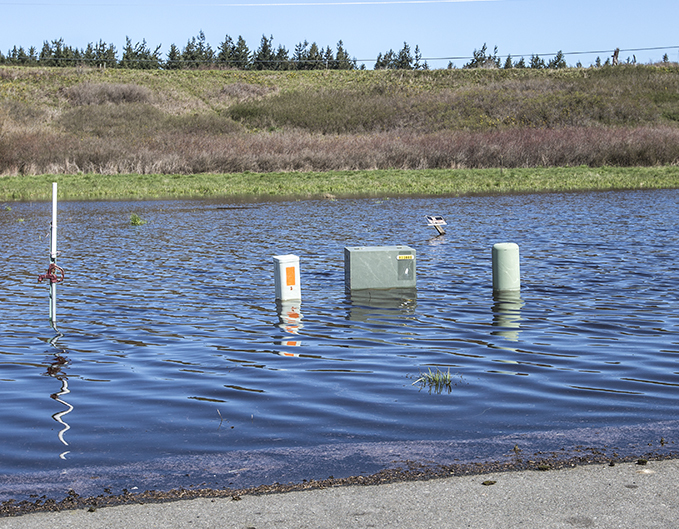 There is a large electric box halfway under water in the photo at the boundary of two of the lots. The point is, the county building department approved this short plat, apparently unaware that it could become part of a Sequim flood. This means when looking at vacant lots where you hope to build your retirement home will involve some due diligence, common sense, and perhaps a local who has been around for a long time. Maybe that way you can avoid your own Sequim flood in your house. I love my Sequim weather station. I actually live in what is nearly the center of the Blue Hole, aka the Sequim Rain Shadow. 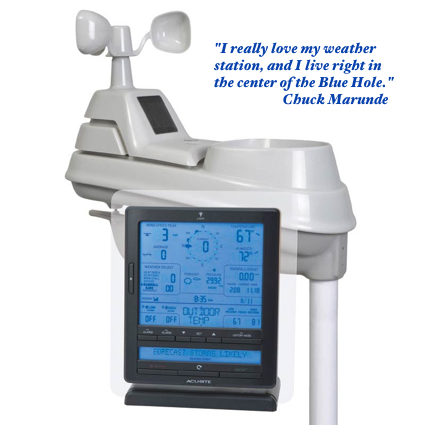 This little Sequim weather station is so cool, I could not resist writing about it and sharing why I think it’s a great investment. We all know what the typical annual precipitation is in the Sequim area (16 inches, 1/3rd of Seattle), and we can look up temperatures on the Internet for any time of year. 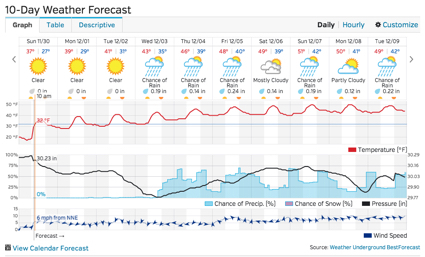 All that is helpful, but when you own a Sequim home, you can’t really tell what the rain fall is in a 24 hour period, or a week, or a month, or the year, unless you have your own Sequim weather station. It’s also nice to know when the temperature reaches freezing. Of course, there’s more. You can monitor temperature, humidity, rain, wind speed and wind direction remotely for any location, track historical records and customize email and text alerts to know when conditions change. You can view your weather from virtually anywhere on a smartphone, tablet or computer with the AcuRite app or myAcuRite.com website, or easily publish your weather reports on Weather Underground. I just think that is cool. By the way, it was very easy to set up, and the monitor sits on my kitchen counter and communicates wirelessly with my outdoor unit. You can set alarms on the system, too. Last night I set an alarm on the temperature when and if it reaches freezing, and it did early this morning. It reached 30 degrees for a short time before going back up. If you have animals like I do, it’s good to know what the outdoor temperature is. I love my Sequim weather station. It’s winter and time for blizzards, tornadoes, floods, and extreme temperature, but not in Sequim. Sequim weather is well known as mild without extremes and without all the terrible natural disasters that hit other states every winter. Winter in Sequim naturally means colder temperatures, some overcast and gray skies, and a little rain. While we might complain a little, we are so fortunate we do not suffer from blizzards, tornadoes, hurricanes, floods, and icy cold temperatures. Many winters we don’t even have snow. Yesterday I drove to Silverdale, which is one hour south of Sequim, and about 10 miles outside of Silverdale, it was snowing with slushy roads. On the way back to Sequim a few hours later, and once again as I got close to Sequim the roads were clean with no snow and no rain. It was overcast in Sequim, and the temperature was about 45 degrees, but I’ll take that any day over the nasty weather that is so common this time of year south and east of Sequim. I don’t miss tornadoes (I lived in Illinois), flash floods (I lived in Vegas), blizzards (I lived in Alaska), 115 degrees or 50 below zero, so I’m thankful Sequim doesn’t have blizzards, or any of these, but Sequim weather is not perfect either. Still, on a scale of 0 to 10 where 10 is the perfect climate, I would rate Sequim a high 7.5. Rain in Sequim? Yes. The joke is that it never rains in Sequim, but of course it does. We’ve had a dry summer, but it has rained generously on and off over the past few weeks, and for that we are grateful. The fields have turned green, and that’s a beautiful thing. 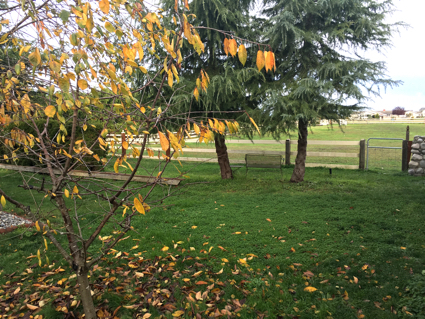 The fall is always gorgeous in Sequim. The leaves have been turning orange and yellow and falling off the trees. The pine trees and the fields are a luscious green. The sunshine, the rain, and the rich soil in the Sequim valley all make for a very healthy environment. This is the time of year when we quit mowing our yards, because the grass stops growing. At the same time, our grass and fields are green throughout the winter, because it stays wet enough and we don’t have temperature extremes. It rarely freezes, so our grass stays green all winter. And you don’t have to mow it! This is a perfect scenario. The Sequim-Dungeness River has been high for a few days because of the steady rain. Since the river comes out of the Olympic Mountains, where there is always much more rain than in Sequim, the water comes pouring out of the mountains and down the Sequim-Dungeness River and into the Strait of Juan de Fuca. While the river has been at flood level, homes don’t get flooded here. It just means the water spreads out in some low areas, but there is no flood damage to properties or homes. The rain in Sequim is welcome. I wish we could share some of our rain in Sequim with our friends in California. Sequim hornets have increased in aggressiveness this summer. I know from personal experience. I haven’t been stung in at least 15 years, and this fall I’ve been stung by hornets on two different occasions. I asked a pest inspector if Sequim hornets and wasps have increased this year, and he said, “most definitely”. Sequim has a very healthy bee population, and that is wonderful for the good work they do pollinating. Bees are not aggressive, and I work in my own garden with lots of bees visiting my flowers. They never bother me. But Sequim hornets have been a different matter this summer, and there’s a reason. Hornets tend to be more aggressive than bees, and they are especially aggressive in hot dry weather. This summer has been a drought of a summer all the way up the west coast, and Sequim has been dryer than in many years past. 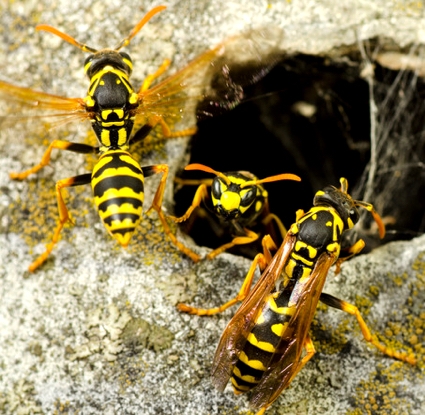 According to one pest expert, the dry weather has brought hornets in closer to homes this summer. So here’s my tip when you are looking at Sequim property. Be careful about turning over little well sheds that have not been disturbed for years. They make a great protected place for a hornets nest. Any outdoor shed makes a potential home for Sequim hornets. Yesterday while walking around a big barn, I was stung by a hornet that came out of a nest in the ground. It appeared they had nested in a mole’s hole. While Sequim hornets have not been any concern in the past, just be watchful this fall as you walk the fields and hunt for your ideal home, or you might be writing an article like this about how you got stung by Sequim hornets. The Sequim Blue Hole strikes again! Live Doppler Radar shows how Sequim and the little Sequim Peninsula is completely dry while all surrounding areas are raining. This became quite an object lesson this afternoon as the Sequim Airport sponsored their annual Sequim Air Affaire. At 7:00 a.m. the airport was nearly socked in and looking ugly, but by noon, the Sequim Blue Hole opened up, while rain clouds and inclement weather could be seen all around the airport. To read more about this famous weather phenomenon, read this article at Sequim Blue Hole. You can learn more about the Sequim Airport and the Air Affaire at Sequim Airport. The Sequim Blue Hole has put Sequim on the map for retirees from all over the United States and the world. This brokerage has had buyers from as far away as the Netherlands, Japan, and China. Retirees are often looking for a climate without extremes, and a place where they can live comfortably and safely. The Sequim Blue Hole puts Sequim between Alaska and Nevada in terms of climate, and has no extreme temperatures and no extreme weather conditions. No wonder so many retirees have been researching Sequim and buying their homes here. For many, the first time they find out about the incredible Sequim weather is when they first read about the Sequim Blue Hole. 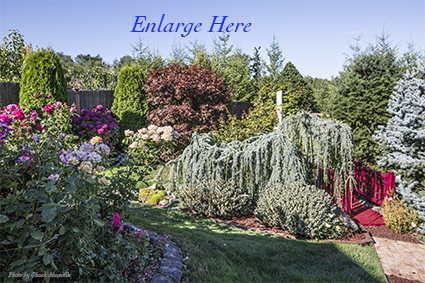 Do you want a beautiful Sequim garden? Are you a master gardener? Do you want your back yard to be a hint of Heaven? This is a Sequim garden of a home I just sold, and even though it is a small lot, this owner has done an amazing job of making this lot a peaceful little haven to enjoy every day. He even has water trickling through the yard which adds to the mood. The amount of landscaping and gardening you want to do or are willing to do to maintain your ideal property is something to consider when you are filtering homes online, although it’s hard to tell from the online photos what will be required. I’ve learned from working with hundreds of buyers that it boils down to personal passions. Maybe you are a master gardener, or you love gardening. Our rich soil, blue hole and sunshine, the climate and the right amount of rain (with some added watering with your loving touch), makes for the perfect garden (elaborate or tiny). See this earlier article about a Sequim Garden. Another home I sold had more than a full acre beautifully landscaped and planted with a wonderful variety of flowers, shrubs, and trees. Of course, this kind of landscaping can be expensive, upwards of $50,000. But the loving touch of a master gardener can turn a boring yard into the kind of Sequim garden in which you think you’ve died and gone to Heaven. See this earlier article describing a Sequim garden at Fine Gardening. Sequim summer weather has been gorgeous of late. This past weekend could not have been more beautiful as it hosted the Sequim Lavender Festival. Sunday evening cooled off after a 90 degree day, and I took this photo as the sun was setting off the northern beaches of Sequim. Enlarge this photo by clicking on it, and you’ll get a much better feel for Sequim summer weather. See if you can spot the only ship on the horizon. Here’s a fun experiment for you. Compare your temperature and weather in your current location in California, or wherever you are, with the temperature and weather in Sequim throughout the year. When it’s 109 in Las Vegas, it is typically 74 in Sequim. Almost too good to be true. Sequim summer weather is nothing less than gorgeous. Imagine sitting on the deck of your new home sipping a delicious latte (or maybe a glass of wine? 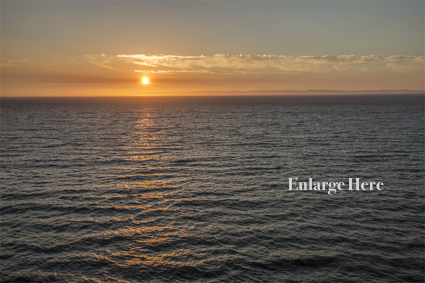 ), looking at a gorgeous water view (or mountain view), a fresh breeze coming from the ocean, and feeling more relaxed than you’ve felt in years now that you’re retired and settled into your dream home. This is a dream come true for many who retire in Sequim (or Port Townsend or Port Angeles). 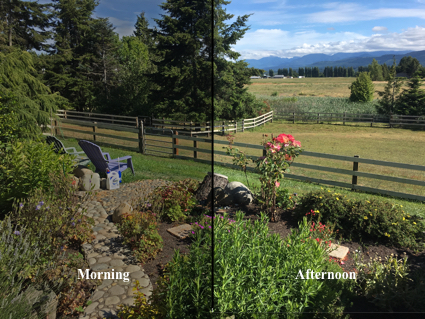 In Sequim the best water view is typically from a deck on the north side of the house, and the sunniest side will be the south side. The mountain view is also to the south. While Sequim is famous for being in the blue hole and only getting 16 inches of rain annually, we do get a combination of sun and rain that is hard on wooden decks. Wooden decks eventually fade, splinter, and rot, so Trex decking or other composite decking that is weather proof has become quite popular. In this photo above, my clients arranged their deck so they could entertain friends, which they enjoying doing regularly. 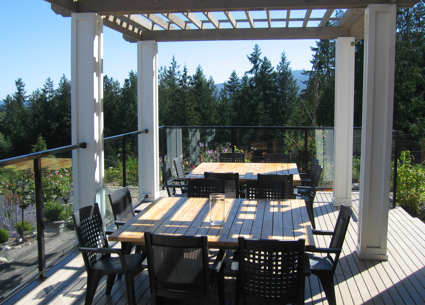 And with a beautiful view of Sequim Bay, their deck is a Heavenly place of peace and relaxation. With spring arriving and flowers blooming, it is time again to enjoy the deck. When you’re looking at homes in the MLS online, it’s hard to tell which way the deck faces, but you can often use Google maps to help answer the question on the exact location of the deck and whether it faces north or south. Sequim weather is one of the major attractions to the Sequim area. 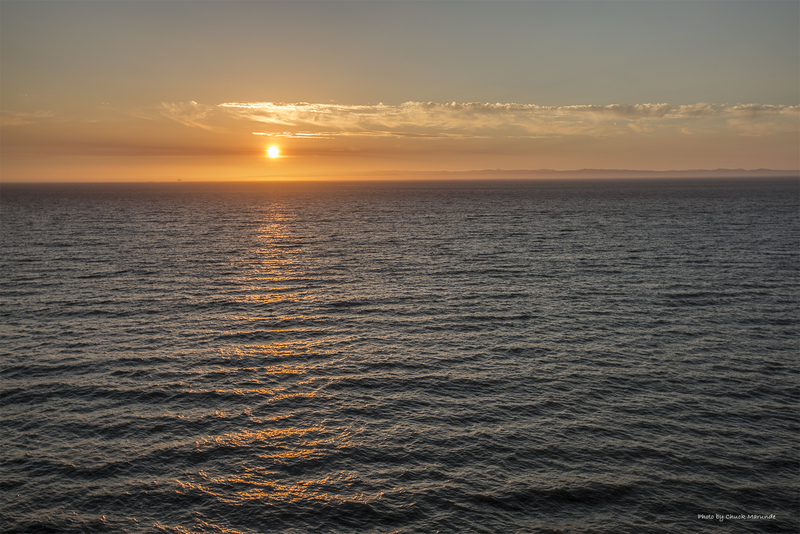 The climate and weather could not be better, and Sequim has become famous for it’s Rain Shadow or Blue Hole with only one-third the rainfall of Seattle, 16 inches, which was the same as the Los Angeles area before their drought. Sequim is uniquely located between the gorgeous Olympic Mountains and the Strait of Juan de Fuca with its many sheltered bays. The question I want to address today is how does rainfall and weather effect Sequim real estate based on the location of a home? Sequim sits right in the blue hole, and as you drive outside this radius of about seven miles, you begin to move into more rainfall. The Sequim Blue Hole is bigger than most people realize. Port Angeles, which is 15 miles west of Sequim, has only 4 to 6 inches more rain, but as you move west of Port Angeles, that is where the rain begins to dramatically increase. As you drive into the hills on the south side of Sequim, the elevation increases, and at 1,000 feet elevation, the rainfall and snowfall (when we have snow) increases. While we don’t get much snow, and some winters see no snow at all, it will stick longer above 1,000 feet elevation than it does in Sequim at only 200 or 300 feet elevation. 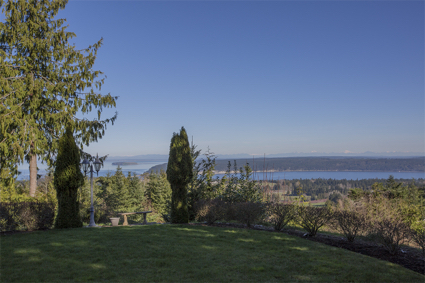 There are some beautiful areas in the hills overlooking Sequim and with stunning water views looking at the islands and British Columbia, but the Sequim weather does change up there. If you want to be as much as you can in the Blue Hole, that is between Sequim and the water to the north. This is where the Sequim weather has made Sequim famous. Sequim Storms – What Storms? Sequim storms are rare, and compared to the rest of the country, Sequim storms are child’s play. Once again we are watching weather reports of a very nasty New York storm and along the northeast. Governors of New York and New Jersey are warning people to stay home. Thousands of flights have been cancelled at airports around the country. Transportation systems have come to a halt in some areas, and thousands of businesses have closed their doors. Not only does the economy and life for thousands of people get disrupted, but unfortunately it seems that everytime there is another major storm, people die too. We are more than lucky that there are no such Sequim storms. We don’t get blizzards, hurricanes, tornadoes, floods, nor do we get the annual snow storms that hit the northeast. Sequim storms are so rare that if you retire in Sequim and live here for 30 years, you might see one or two bad snow storms, but nothing like what New York gets regularly. You might hear of a small flood along the Dunegness River, but even that flooding has only reached a hand full of homes in the past 50 years, and there hasn’t been any flood since the Core of Engineers strategically built some dikes. We are more than fortunate that there are virtually no dangerous Sequim storms. About 15 years ago I remember a heavy snow in Sequim. This was the only bad storm I recall in 21 years of living in Sequim. The snow was several feet deep, and for Sequimites, that was extraordinary. 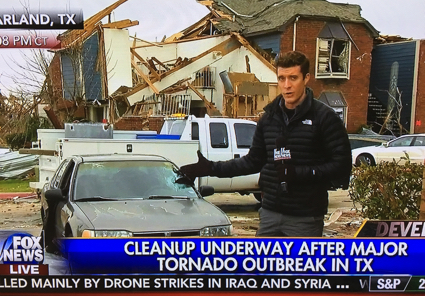 We just stayed home, so there really was no danger. The snow only came down for a few days, and then it began to melt quickly. But many of us could not drive out of our driveways for a couple of days, so it was exciting, but it was never dangerous. Living in such a mild climate with no extremes either way, Sequim has become known as one of the 10 best places to retire in America. There are many reasons for that, but certainly one reason is that we just don’t have bad Sequim storms. 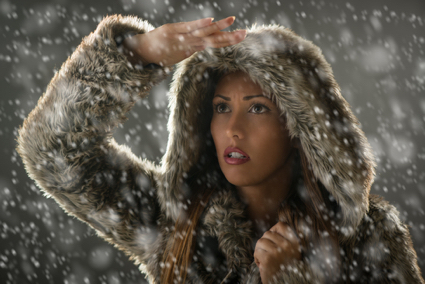 Sequim winter weather has descended upon us, and it is cold–below freezing! While that isn’t cold for many areas of the country, it is for Sequim. In the coldest Sequim winter weather we will see the temperature dip below freezing, but it doesn’t stay there long. Late last night and early this morning we had temps in the mid-20s, and during the day the temp will still be cold but above freezing. Some buyers are still coming to Sequim to look at homes and some are buying even in December, but many others don’t want to drive around to look at homes when it is only 40 degrees in the afternoon. It’s a good time to come if you can, because there is less competition and seller’s are motivated, but if you’re planning to come in the spring, that’s a beautiful time of year to look at homes and see the area. I love the way we can instantly look at Sequim winter weather on a smart phone, a tablet, or on a computer. You’ve gotta love the Internet for things like this. Talking about cold weather, we also had some snow in Sequim. Our snow doesn’t last long as it usually melts within a day or two, but we have some unusually cold weather, so we shall see. 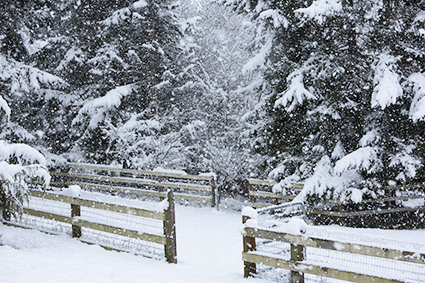 You can click on the image above to see Sequim winter weather. Stay tuned . . . to the Internet on the subject of Sequim winter weather.